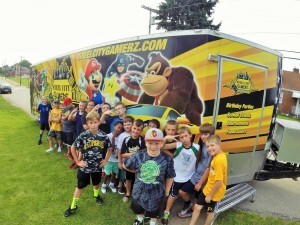 mobile game truck | Pittsburgh's Best Mobile Video Game Truck & Laser Tag Birthday Party Place in Pennsylvania! Allegheny County and MORE! WHICH SYSTEM IS BETTER: PLAYSTATION 4 OR XBOX ONE? So a popular question I get asked often is which system is better, Playstion 4 or Xbox One? Now if you have a young child your Nintendo Wii U and the portable Nintendo Switch may be your best bet. If you decide on the Nintendo route I would go with the Nintendo Switch. Eventually, they will do away with the Wii U plus the Nintendo Switch is a AWESOME interactive Gaming System! Sorry, back to the main topic. So, I am not going to get into frame rates, processor speeds, power usage and compare each systems specs. Instead, I will focus on what is more practical. Of course, when you decide to purchase a new gaming system for your son or daughter it comes with a substantial cost. Between System, Controllers, games and extra add ons your looking close to a $500-$750 dollar “investment”. So, it all comes down to this. Is Playstation 4 better than Xbox One? It has a Ford and Chevy feel to it. Some like Ford other like Chevy…I feel the same about each gaming system. Here is my advice that most don’t consider in the buying process. Find out which system is most popular with your child’s friends. Use that information on determining whether to buy a Playstation 4 or Xbox One! South Park Township’s annual Community Day will be held on Saturday, September 16, 2017, at the South Park Fairgrounds. Festivities will start at noon with the parade along Corrigan Drive to Brownsville Road and into the Fairgrounds. 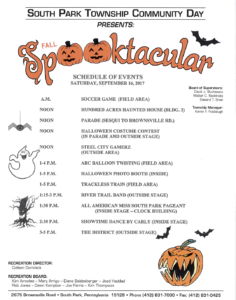 The theme this year is “Fall Spooktacular.” The celebration will include demonstrations, crafts and informational booths in the fairground buildings and surrounding areas. Local businesses and school groups will also be there with a variety of food and games to please everyone. There are plenty of activities for the kids and lots of entertainment and interesting booths throughout the fairgrounds. Soccer teams will be playing games all day. The District Band as well as River Trail Band will be on the outside stage. For more information, please contact Recreation Director, Colleen Dominick at412-831-7000. The schedule of events for Community Day can be found here. Booth application forms are available at the Administration Building and online. Applications will be due on September 1, 2017. View a Booth Application Here. Parade application forms for parade participants are available at the Administration Building and online. Applications will be due on September 1, 2017. View a Parade Application Here. Entry forms for the Children’s Halloween Costume Contest are available at the Administration Building and online. Forms will be due on September 11, 2017. View a Halloween Costume Contest Entry Form Here. Entry forms for the All American Miss Pageant are available at the Administration Building and online. Forms will be due on September 12, 2017. View a Pageant Entry Form Here. THE “FREE” HUNDRED ACRES MANOR HAUNTED HOUSE IS COMING BACK TO OUR COMMUNITY DAY EVENT! CLICK HERE FOR DETAILS.